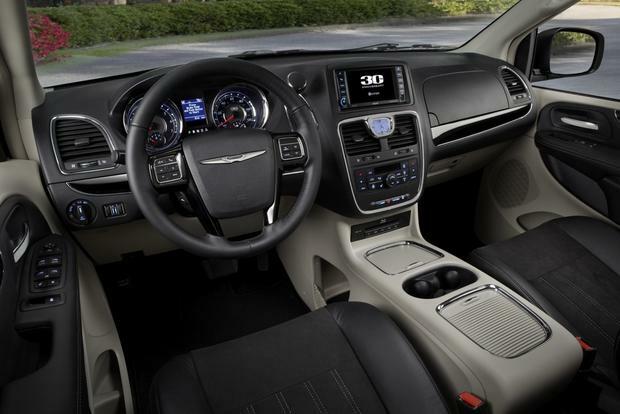 The 2016 Chrysler Town & Country minivan boasts a lot of standard luxuries for an impressive price. 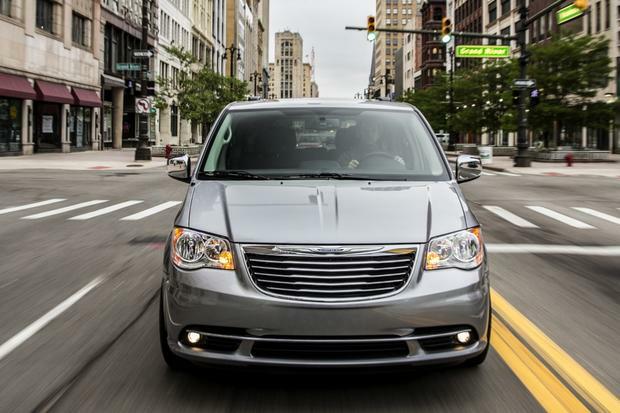 2015 Chrysler Town & Country vs. 2015 Dodge Grand Caravan: What's the Difference? We've researched all the major differences between two popular minivans: the 2015 Dodge Grand Caravan and the 2015 Chrysler Town & Country. Looking for a good deal on a minivan? Here are five recent models you can get with a CPO warranty -- and a $10,000 discount. 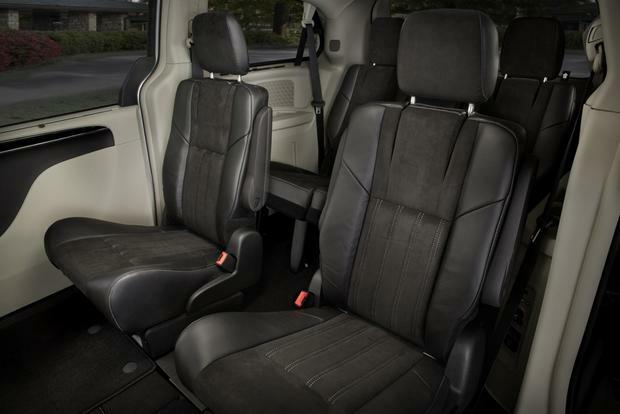 The 2014 Chrysler Town & Country minivan boasts a lot of standard luxuries for an impressive price. 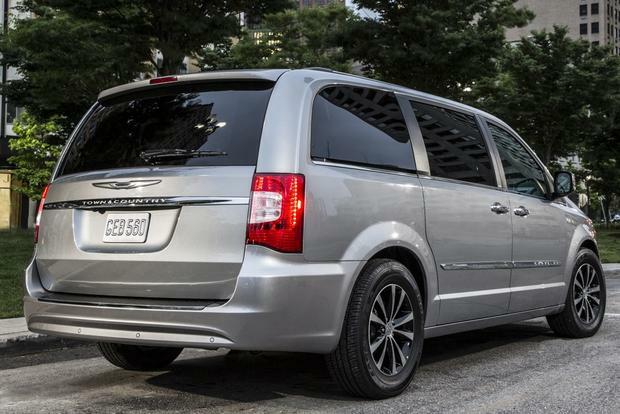 The 2015 Chrysler Town & Country may look a lot like the one Chrysler has been selling for the last few years. 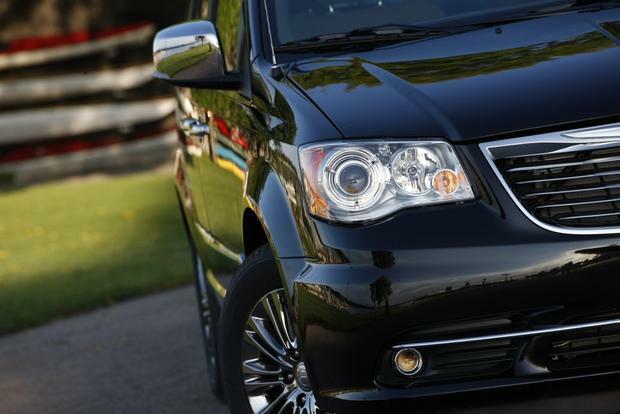 Back in 2011, the Town & Country received a thorough rejuvenation, including a fresh interior and a new V6, which made it one of the best-driving and best-equipped minivans ever. It was finally the well-rounded product that it should have been from the beginning. 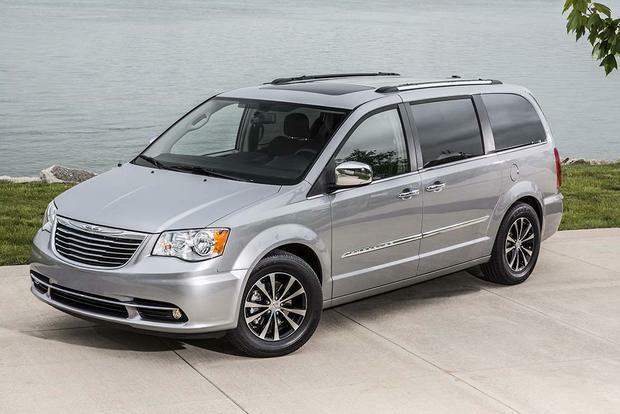 Compared to its mechanical twin -- the very similar, bargain-priced Dodge Grand Caravan -- the Town & Country is pricier. It comes with a tremendous amount of standard features, however, including a DVD entertainment system and leather upholstery. A recently added S model brings a sporty flair to the table. There's clearly a market for luxurious minivans. Particularly when loaded with options, the T&C undercuts comparably equipped Japanese-brand competitors by thousands of dollars without feeling the least bit cheap inside. In fact, the dressy interior delivers quite a sense of occasion. With a new model on its way -- likely for 2016 -- the Town & Country is largely unchanged for 2015, save for a newly renamed Limited Platinum trim level replacing last year's Limited. The Town & Country is powered by a 3.6-liter V6 that's rated at 283 horsepower and 260 lb-ft of torque, mated to a 6-speed automatic transmission. It's only available with front-wheel drive. Fuel economy is about average for the class at 17 miles per gallon in the city and 25 mpg on the highway. 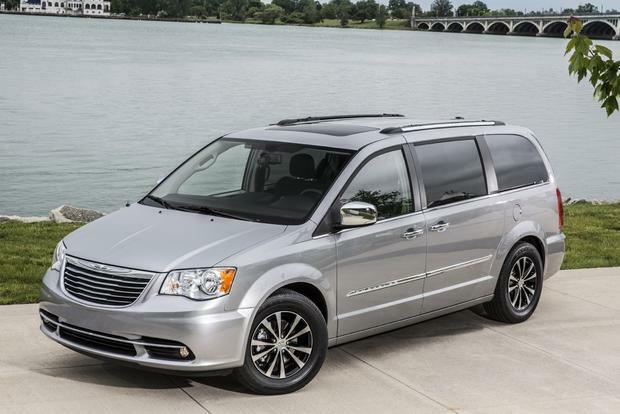 The 2015 Chrysler Town & Country is offered in four trim levels: Touring, S, Touring-L and Limited Platinum. Even the base Touring ($31,800) is chock-full of niceties, including 17-inch alloy wheels, a power driver's seat, power adjustable pedals, 3-zone automatic climate control, cruise control, first- and second-row leather upholstery (cloth is a no-cost option), fold-flat rear seats, a rear-seat DVD entertainment system, a 6-speaker audio system, and a 6.5-in touchscreen interface with a rearview camera, USB/Bluetooth connectivity and 30 gigabytes of digital music storage. Adding navigation for $895 also includes a backup camera. The sporty Town & Country S ($33,900) features sporty body accents such as darkened head-lamp bezels, a black chrome grille, 17-in polished alloy wheels with painted pockets and more. The S model's interior is rendered in all black with Torino leather seats (with the letter S embroidered on the seat backs), as well as contrast stitching, piano-black trim and a black headliner. It comes with a performance suspension. It is also available only in black, white, dark red or dark silver for exterior colors. The Touring-L ($35,400) receives standard rear parking sensors, automatic high-beam head lamps and a blind spot monitoring system. Rear cross-path detection, second- and third-row window shades and eligibility for a variety of upgrades are included as well, including extra-luxurious second-row captain's chairs, dual rear entertainment screens and a power-folding third-row seat with power recline. The newly renamed Limited Platinum ($40,900) has polished wheels, HID headlamps, leather and suede upholstery, a Blu-ray DVD player with dual 9-in screens, and knickknacks such as keyless entry with push-button ignition, a leather and wood steering wheel, navigation, and an exclusive 9-speaker, 506-watt audio system. Note that many of the fancier models' features are optional on lesser T&C models. The 2015 Town & Country comes with standard stability control, anti-lock disc brakes and seven airbags (front, front-side, full-length, side-curtain, driver-knee), a rear backup camera and a trailer-sway control system. In government crash-testing, the Town & Country received an overall rating of four stars out of five, including four stars for frontal impacts, five stars for side impacts and four stars in the rollover test. The independent Insurance Institute for Highway Safety deemed the Grand Caravan Good -- the highest possible rating -- in every category. Furthermore, the Town & Country is available with the SafetyTec package (standard on Touring-L and Limited Platinum models), which includes rain-sensing wipers, parking sensors, SmartBeam headlamps, a blind spot monitoring system and rear cross-path detection. The Town & Country has plenty of power under the hood and delivers quick manual shifts with the automatic's shifter in AutoStick mode. We love the hushed, smooth highway ride, as well. Full loads rarely present a problem, though you may notice that the V6 is a bit soft at low engine speeds if you're a speed demon. 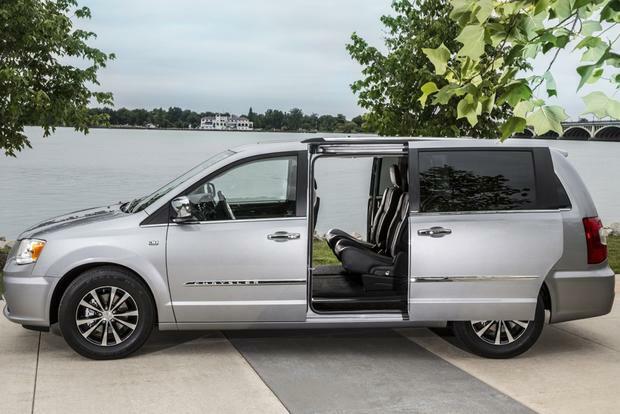 Anyone who expects that minivans are nothing more than porky, tippy kid shuttles will be pleasantly surprised with the Town & Country's handing, as well as its excellent body control and crisp steering. 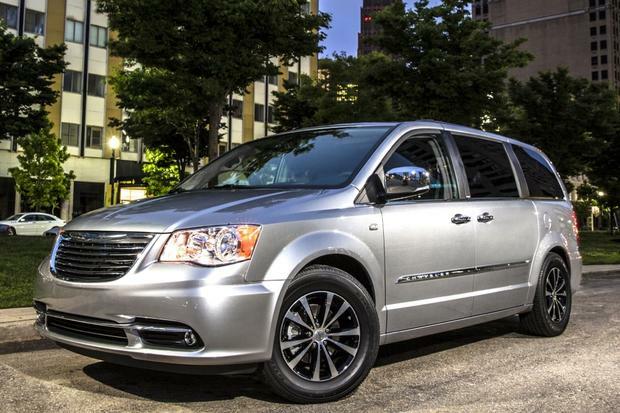 The solid handling gives the Town & Country a sense of maneuverability that's absent from some vans. The S model gets even better thanks to its retuned suspension. Honda Odyssey -- The Honda Odyssey boasts an impressive technology suite and comfy accommodations, but its dull dynamics and odd styling are question marks. 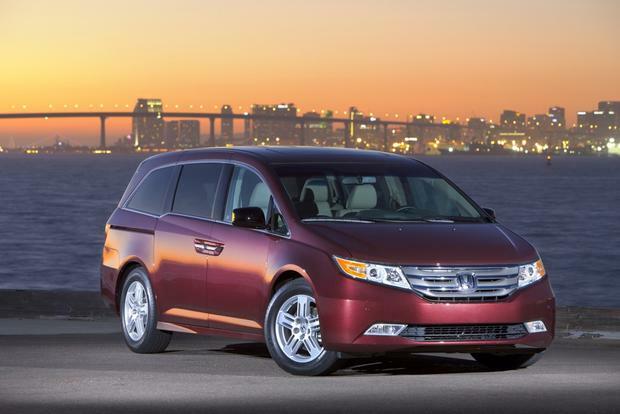 Few minivans, however, offer the sort of interior flexibility and ergonomic usefulness that characterize the Odyssey. Nissan Quest -- Based on a Japanese-market van, the Nissan Quest is taller and narrower than the rest, but it also has the nicest interior design, delightful seats and an eager V6. It's too bad about its droning continuously variable transmission and high load floor, though. Toyota Sienna -- The Sienna is huge inside but rather devoid of character compared to the Town & Country. It also offers a novel split-screen entertainment system that allows two kids to do their own thing simultaneously. The available second-row captain's chairs are very nice, but we'd rather pick up an entry-level Touring for its $31,000-ish base price. Did you see all those standard features? It's a lot of minivan for the money, even with the much cheaper Grand Caravan likely right next door on the dealer lot. If your kids want to pretend that they're secret agents every time they get in and out, however, the S model is the one to get.